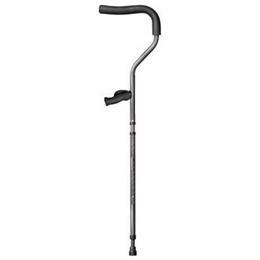 Traditional crutch design has not changed in over 70 years. They are not ergonomically designed and thus force the user to adapt to them. Traditional crutch use over time can cause additional strains to joints, tendons, and ligaments. This strain can lead to additional problems including tendinitis and carpal tunnel syndrome. The In-Motion Crutches have been designed from the ground up to address the problems associated with traditional crutch use. Working together as a functional unit, the features of the In-Motion Crutches provide for a comfortable experience while on crutches. The features include the large Underarm Cradle, an Ergonomic Grip, a very popular Folding Design and a Shock Absorbing/Power Assist Feature. 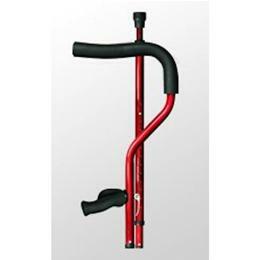 The Extended Range of the Crutch also fits a larger range of heights than a traditional Crutch. Traditional crutches are awkward to use in crowded settings such as in a car, or on an airplane, sitting in an audience, or at a restaurant. 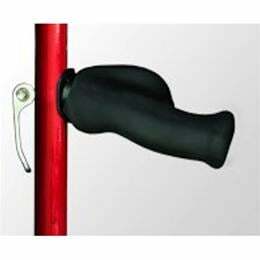 The collapsible feature of our crutch makes using it in public places much more convenient. It simply folds for easy storage. The ergonomic grip on our shock-absorbing crutch is at an angle (12°) designed to provide the greatest amount of blood flow and reduced trauma to the nervous system. This unique feature provides for better sense of stability in use. The cradle feature allows for greater position confidence while in the walking motion. As the walking movement proceeds, the front position of the under arm cradle gives the user forward arm and shoulder support. 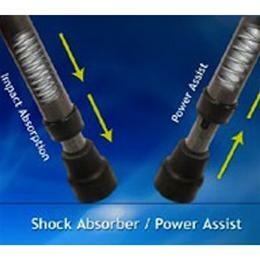 Consequently, there is less reliance on the direct underarm pressure. Since the user relies less on the underarm support, there is a reduction in back and shoulder stress.